Wood and wood products have played a critical role in the evolution of humankind. From the most primitive of beginnings, humans have used wood for survival and to improve the quality of life. In the twenty-first century, people continue to use wood for many of the same purposes that their most ancient ancestors did. Fuel for heating and cooking is still the largest consumer of wood fiber. Construction of shelter and furniture is secondary as is pulp and paper production. As a raw material, nothing else in history possesses the versatility of timber. On a volumetric basis, in the year 2000 worldwide annual consumption was between 3 and 4 billion cubic meters. To put this in perspective, if all of this wood was lashed together it could make a floating bridge 2 meters (6.54 feet) thick and 40 meters (131 feet) wide that stretches around the world at the equator. As evidence of wood's exceptional utility value, there are approximately 5,000 distinctly different types and applications of wood products in society. 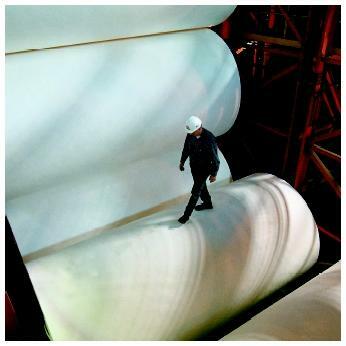 A man walks across giant rollers used to crush wood pulp at the Ketchikan Pulp Company in Ketchikan, Alaska. and handling costs associated with concrete limit its use to areas close in proximity to the raw mineral mines. Petrochemical-based plastics offer new alternatives to wood use in construction but such plastics are not renewable. The energy requirements and pollution volumes associated with the production of each of these products is significantly higher than those levels associated with wood products conversion, often four to ten times greater. Additionally, of the materials concrete, plastic, steel, and wood, only wood is naturally renewable. In the United States, most round wood (in the form of stems or logs) comes from managed forest land (both public and private). The growing population's demand for land, renewable raw materials, and environmental protection has pushed forest management and wood products production to become highly efficient and ecologically healthy. Most management strategies are geared toward multiple use; that is, recreation, wildlife, sporting, ecology, and other uses are included with timber production. Both natural regeneration and manual replanting are used to restock forest land after timber harvesting. North America is rich with productive land on which to grow trees and with intellectual capital to promote the wise, efficient, and sustainable use of wood fiber. Third-party certification or "green" labeling is emerging as a means to assure wise and efficient forest management and timber conversion. Also, approval by the International Standards Organization (ISO) is a key tool for companies involved in worldwide wood products trading. Companies that are able to gain wood certification and/or ISO approval have a distinct market advantage because consumers have assurance that the products or materials they consume have conformed to stringent manufacturing and sound environmental principles. The techniques of timber conversion (turning trees into wood products) have been evolving for thousands of years. During the latter half of the twentieth century, conversion technology advanced exponentially. Computer power has been a key ingredient for optimizing production of wood products. Sawmilling (turning trees into lumber) has been practiced for hundreds of years. Formerly, only the biggest and best trees were cut and brought to mills, and people made decisions regarding how to cut these into lumber. During the early 1900s, sawmill timber conversion efficiency was approximately 35 to 40 percent, meaning more than half of each trunk was wasted. In the twenty-first century, computers and automated equipment often make most of the decisions regarding how tree stems will be converted to products. The scanning and automation technology used in the forest products industry is the same as that used by the military and the automobile and aerospace industries. Development and application of such technology has allowed smaller and less valuable trees to be used for products. Historically, the wood fiber that did not become lumber was burned or landfilled. Today, conversion efficiency can reach 70 percent. (There is always some inherent loss associated with turning round stems into rectangular boards.) The residual chips and sawdust from sawmilling are turned into pulp for paper and particles for pressed wood composites. Bark is mainly used as fuel or mulch. The close alliance of these different industries can raise conversion efficiency to 100 percent. In addition to solid lumber production, there are a variety of composite wood products that have been developed. Plywood and laminated veneer lumber use thin sheets of wood veneer as lamina (layers) for panel-type and lumber-type products, respectively. The conversion efficiency associated with wood veneer production is higher than that of lumber production. Oriented strand products use thin wafers of wood as a raw material. In this case, low-grade trees are reduced to thousands of small strands, and the strands are subsequently pressed together with adhesive into panel products. When trees are reduced to strands, conversion efficiency is 90 to 95 percent. The only fraction not used for strands is the bark, which is converted to fuel or mulch. Structural panel products like plywood and oriented strand board have revolutionized the building construction industry in the Americas and worldwide. Panel products allow rapid housing construction and provide many superior properties compared to the materials used previously. Non-structural wood composites offer further utilization potential for wood fiber. Often using waste sawdust or shavings as raw materials, particleboard and medium-density fiber board are used extensively in the furniture and cabinet industry. These stable products are used as core materials for both lowand high-cost furniture. When used properly, each of these composite products offers advantages over traditional solid wood products. Dimensional stability, uniformity, long spans, and engineered strength enhancement are just a few such advantages. The quest to develop stronger, straighter, and more efficient renewable products is ongoing. In an effort to better utilize agricultural byproducts, materials such as wheat straw, kenaf, cotton gin trash, and bagasse are being researched as supplemental fiber sources in wood-based composites. Advanced hybrid composites between wood and materials such as carbon fiber, plastics, and fiberglass have been investigated and are becoming more common in highly specialized structural materials. The level of information-sharing currently available through technology continues to foster the research and development of amazing products at a record pace. Haygreen, John G., and Jim L. Bowyer. Forest Products and Wood Science: An Introduction, 3rd ed. Ames, IA: Iowa State University Press, 1996. Hoadley, R. Bruce. Understanding Wood: A Craftsman's Guide to Wood Technology. Newtown, CT: The Taunton Press, Inc, 1990. Walker, Aiden, ed. The Encyclopedia of Wood. London, England: Quarto Publishing, 1989. Wood Handbook: Wood as an Engineering Material. Publication No. FPL-GTR-113. Madison, WI: U.S. Forest Service, 1999. The United Nation's Food and Agriculture Organization has reported that the world's overall forest area declined by 1.6 percent (140 million acres) between 1990 and 1995. Because of this sharp decline, there is a growing trend toward harvesting from plantation forests versus natural forests.